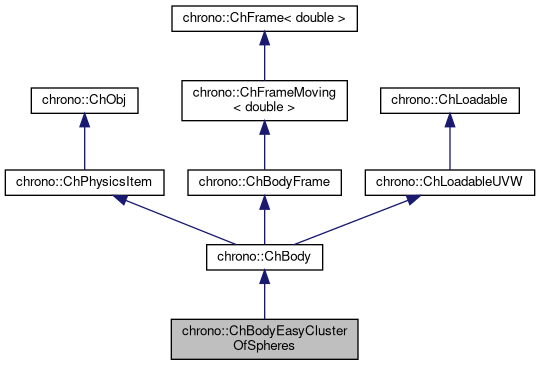 Easy-to-use class for quick creation of rigid bodies with a shape made of a cluster of spheres. mass and moment of inertia is automatically set, according to the geometry. NOTE! mass and inertia are computed as if spheres are not intersecting! If you need a more precise mass/inertia estimation when spheres are intersecting, change mass and inertia after creation using more advanced formulas. Mass and inertia are set automatically depending on density. The cluster of spheres will be displaced so that their center of mass corresponds to the origin of the ChBody.